Summon: See a vision of two of your opponent's cards. Guess which one is in their hand. If you're right, draw a copy of it. 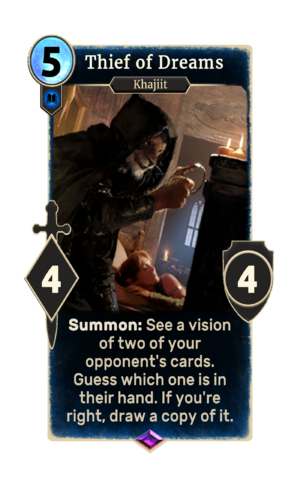 Thief of Dreams is an epic Intelligence creature card. It is part of the Heroes of Skyrim expansion. "Ah... It seems Khajiit was outwitted." "This one will be taking that." The card's power and health were previously 5, until these were decreased in Patch 1.66.1. This page was last modified on 27 February 2019, at 19:48.